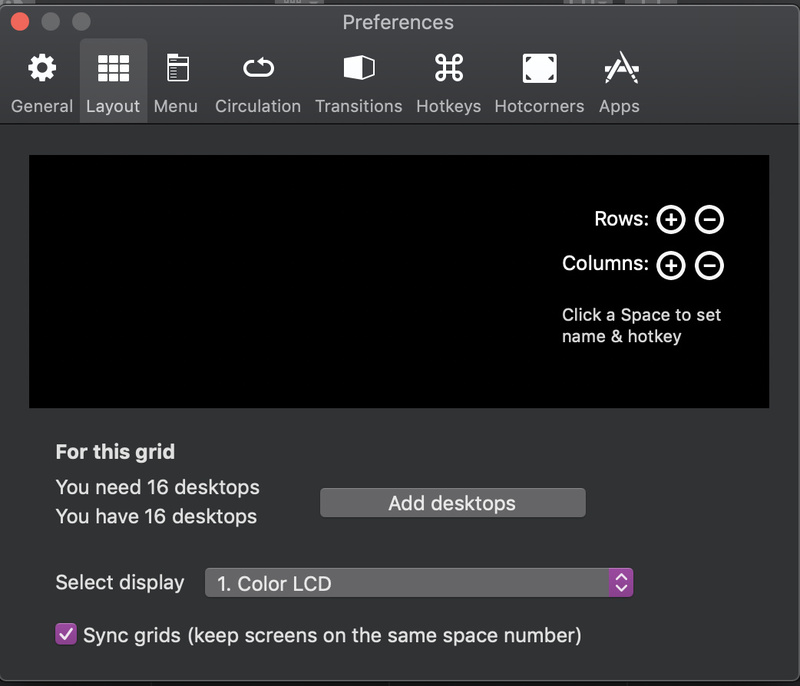 I just upgraded to 10.14 yesterday on my iMac connected with an additional external Thunderbolt Display and could not get the layout to show any desktops. I tried multiple restarts, disconnecting the external display, restarting TotalSpaces to no avail. Funny thing is, it works fine on my MacBook Pro connected to an external display. It’s like it’s stuck on 16 desktops even though I technically only have 1. I am also running the latest version of TotalSpaces2 2.7.5. A hint to what might be wrong is every time I restart total spaces I get a notification saying TotalSpaces2 failed to start and to check the system preferences > security & privacy > Privacy > Automation to make sure it can control the Dock than restart. I have done this several times and verified it can do this. Thanks for the report. It seems that sometimes the dock component doesn’t find everything it needs, I will try to figure out why. It’s going to take a bit more time to solve this, but I am working on it (we understand the issue, but haven’t found a suitable workaround yet). This version fixes a few bugs, including, I hope, this issue. Thanks! Seems to work now! Somehow it broke again on my iMac. I will send an email with the console log. Just because I’m stubborn, I kept closing/reopening it, and all of a sudden, it worked! TotalSpaces is not working for me at all, and hasn´t for a while (10.14.3 Beta (18D32a) and several previous betas). I can not add any rows or columns or desktops. I just signed up for this forum because I have the same problem. I have the latest version and I just paid for a license. I have System Integrity disabled too for my Mojave iMac. This software worked fine for the first week or two. This sofware doesn’t work well, I have to restart my laptop to avoid to have “16 desktops”. I have to re install mojave again because the app breaks my system, when installing the app my laptop could not be turned off and always used the power button to turn off the computer, I think the app is unstable. Any updates on this? I have just purchased a licence, disabled SIP, installed the latest version (2.7.12) on Mojave (10.14.3). I purchased a new Mac Mini last week which forces me to run Mojave. I run two screens, and, as with others, Mojave broke TotalSpaces for me. The following seems to fix it…and I have no idea why! There is a small, free app available from GitHub called WhichSpace. It is at version 0.2.4 and I don’t even know if it is being actively developed. Its sole purpose is to display the number of the current space in the menubar. That’s all it does. When this app is running TotalSpaces seems to function correctly. Am I nuts? Would someone else try installing WhichSpace, see if it fixes their TotalSpaces issue, and then report back to this thread with their experience?